I've enjoyed harvesting fresh basil, parsley, and fennel from my garden all summer. Now that fall has arrived, it's easy to forget about those fresh herbs and resign myself to cooking with dried herbs. But I'm not giving up just yet. Some herb plants can be brought indoors to grow for months, providing summer flavor for my cooking. Others can be protected in the garden over the winter and they will bounce back next spring. Here are some suggestions for keeping herbs through the winter -- indoors and out. Herb plants can be annual, biennial, or perennial. 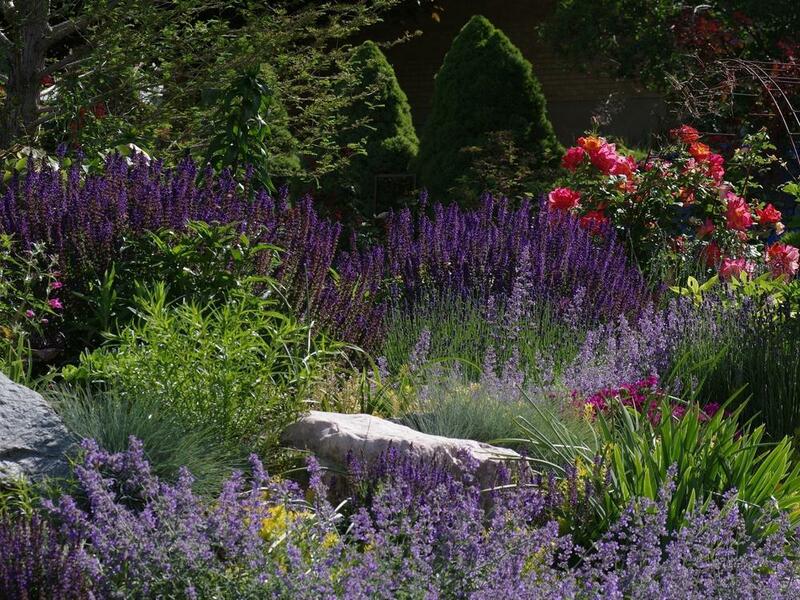 Perennial herbs, such as chives, lavender, oregano, thyme, overwinter well in the ground. In most areas simply wait until a few hard freezes and then cut back tall herbs to within 4 to 6 inches of the ground. In cold winter areas (USDA zones 3-5), add a 2- to 3-inch-thick layer of shredded bark mulch on top of the herbs for added protection. The bark will prevent the ground from freezing and thawing in winter, making it less likely the herb roots will heave out of the ground, desiccate, and die. You can enjoy tender perennial herbs such as rosemary, and biennial herbs such as parsley, all winter long by potting them up and bringing them indoors for the winter. Here's how. Dig parsley plants now, making sure to get most of the root system. Pot them in deep containers, water well, and leave them outdoors for a few weeks in a shaded area to recover from transplant shock. Once they've revived, bring the plants indoors before a hard freeze and place them in a sunny window. You should be able to harvest fresh parsley leaves all fall, and if the plant gets enough light, it will even produce new growth. However, by late winter the leaf quality will decrease as the plant gets ready to produce a seed stalk. At that time simply compost the plant. Most rosemary varieties are hardy to USDA zone 7, perhaps even zone 6 with protection. In colder areas you'll have to bring your plant indoors to survive the winter. Pot it up and allow time for it to adjust to container life. Bring it indoors before a hard freeze and place it in a sunny southern window. Rosemary likes cool temperatures, high humidity, and barely moist soil in winter. Place the plant in a 50- to 60-degree F room. Keep the humidity high by misting often, and place the pot on a pebble tray filled with water. Water the pot just enough to keep the soil from drying out. Your plant may not grow much in winter, but it should survive and be ready to go outdoors next spring. Plus, you'll have the fragrance and taste of fresh rosemary in your kitchen all winter. You also can bring hardy herbs indoors in pots, not for their protection but for your use. Herbs such as thyme, oregano, and mint can spend the winters indoors in pots to provide fresh leaves for cooking while the snow flies. Simply move them back outdoors in spring and plant them in the garden. If you don't have room to bring in a large potted plant, take cuttings of rosemary, lavender, pineapple sage, and other woody perennial herbs. Root the 4- to 6-inch-long cuttings by dipping the cut ends in a rooting hormone powder. Stick the cuttings in a pot filled with moistened vermiculite or sand, cover the pot with a clear plastic bag with slits in it, and keep it in a warm, bright room out of direct sunlight. Once rooted, the cuttings can be transplanted into individual pots and grown under lights all winter. Not only will you have fresh herbs to eat, you'll have some new plants to grow in your garden next spring. While annual herbs such as basil need to be sown each spring, some herbs will do the sowing themselves and come back year after year. Culinary herbs that readily self sow include coriander and dill. Collect the seeds now and store them in glass jars in a cool location. Sow them next spring. You also can allow the seeds to naturally drop to the ground in the garden and self sow on their own. The seeds will sprout in fall or early spring, depending on your location. In warm-winter areas you may have a continual supply of these herbs throughout the winter depending on the weather.